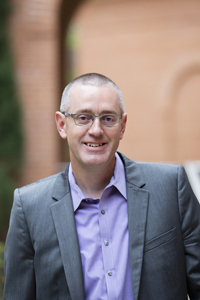 Baylor>Department of Religion>Our Faculty>Faculty>Paul Martens, Ph.D.
Dr. Paul Martens, born and raised on the Canadian prairies, has been teaching at Baylor since 2006. He graduated with a PhD in Theology from the University of Notre Dame in 2005 and spent the subsequent year as a Post-Doctoral Fellow at Notre Dame. Specializing in Christian ethics, his research focuses on Søren Kierkegaard, Anabaptist theology and ethics, and issues surrounding Christian articulations of pacifism and just war. Outside of the office, he enjoys spending time with his wife and four daughters, cycling, and trail running. Christian ethics and theology; global ethics; environmental ethics; peace, violence, and war; Søren Kierkegaard; and Protestant retrievals of natural law. Kierkegaard: A (Very) Critical Introduction. Intervention Series. Grand Rapids, MI: Eerdmans – forthcoming. Reading Kierkegaard II: A Guide to Works of Love. Eugene, OR: Cascade – forthcoming. Reading Kierkegaard I: A Guide to Fear and Trembling. Eugene, OR: Cascade, 2017. The Heterodox Yoder. Eugene, OR: Cascade, 2012. Kierkegaard and Christian Faith (with C. Stephen Evans), Waco, TX: Baylor University Press. John Howard Yoder, Revolutionary Christianity: The 1966 South American Lectures (with Mark Nation, Matthew Porter, and Myles Werntz), Eugene, OR: Cascade, 2012. John Howard Yoder: Spiritual Writings (with Jenny Howell), Modern Spiritual Masters Series. Maryknoll, NY: Orbis Press, 2011. John Howard Yoder, Nonviolence – A Brief History: The Warsaw Lectures (with Matthew Porter and Myles Werntz), Waco, TX: Baylor University Press, 2010. “Virtue and Character,” in The Oxford Handbook of Nineteenth-Century Christian Thought (214-226), ed. Joel D. S. Rasmussen, Judith Wolfe, and Johannes Zachhuber (Oxford: Oxford University Press, 2017). “While All Creation Groans: Gestures toward Hope amidst the War at the Heart of Nature,” in Theology and the Films of Terrence Malick (pp. 159-172), ed. Christopher B. Barnett and Clark J. Elliston (New York: Routledge, 2016). “Anabaptist Ethics after Yoder: Accepting the Limits on the Freedom of a Christian Ethicist,” in The Freedom of a Christian Ethicist: The Future of a Reformation Legacy (pp. 107-126), ed. Brian Brock and Michael Mawson (London: Bloomsbury T&T Clark, 2016). “Kierkegaard and the Peaceable Kingdom,” in Kierkegaard and Christian Faith (pp. 173-186), ed. Paul Martens and C. Stephen Evans (Waco, TX: Baylor University Press, 2016). "By What Criteria Does a ‘Grand Noble Experiment’ Fail? What the Case of John Howard Yoder Reveals about the Mennonite Church" (with David Cramer), The Mennonite Quarterly Review 89.1 (2015): 171-193. "Kierkegaard for THIS World: Thinking with Kierkegaard about the Desire for Security as a Sickness unto Death," in The Theologically Formed Heart: Essays in Honor of David Gouwens (pp. 264-278), ed. Warner M. Bailey, Lee C. Barrett III, and James O. Duke (Eugene, OR: Pickwick, 2014). "‘Can the Knight of Faith be like an Inspector of Taxes?’ Reading Iris Murdoch Reading Kierkegaard," in Iris Murdoch Connected: Critical Essays on Her Fiction and Philosophy, Tennessee Studies of Literature Series, Volume 47 (pp. 169-182), ed. Mark Luprecht (Knoxville, TN: University of Tennessee Press, 2014). "Kierkegaard and the Bible," in The Oxford Handbook to Kierkegaard (pp. 150-165), eds. George Pattison and John Lippitt (Oxford: Oxford University Press, 2013). "George Steiner: Playing Kierkegaard's Theological-Philosophic-Psychological Sports," in Kierkegaard's Influence on Literature, Criticism, and Art. Volume 12, Tome III of Kierkegaard Research: Sources, Reception and Resources (pp. 193-212), ed. Jon Stewart (Aldershot: Ashgate Publishing, 2013). "With the Natural Grain of the Universe: Reexamining the Alleged Pacifist Rejection of Natural Law," Journal of the Society of Christian Ethics 32.2 (2012): 113-131. "Iris Murdoch: Kierkegaard as Existentialist, Romantic, Hegelian, and Problematically Religious," in Kierkegaard's Influence on Philosophy. Volume 11, Tome III of Kierkegaard Research: Sources, Reception and Resources (pp. 135-56), ed. Jon Stewart (Aldershot: Ashgate Publishing, 2012). "‘The Changelessness of God' as Kierkegaard's Final Theodicy: God and the Gift of Suffering," (with Tom Millay) International Journal of Systematic Theology 13.2 (2011): 170-189.